The date picker field creates a jquery date selection popup. This field is useful for setting dates to use in your theme. eg. An event’s start and end date. Please note that previous versions of ACF contained a setting called ‘Save Format’. This setting allowed the developer to change the format saved in the DB. Although useful, this setting created many issues and has been removed in favor of a set format of ‘YYYYMMDD’. Return format The date format that is returned when loading the value. Please note that the value is always saved as YYYYMMDD in the DB. The date picker field will return a string containing your date value in the format provided in the field’s settings. Please note the following examples assume a field exists called ‘date’. This example shows how to display a date value. This example shows how to get the raw value (saved in format YYYYMMDD) and convert it to a numeric value to then modify it further. If you require the date to be displayed in a non English language, WordPress contains a function called date_i18n() which will perform the translation for you. 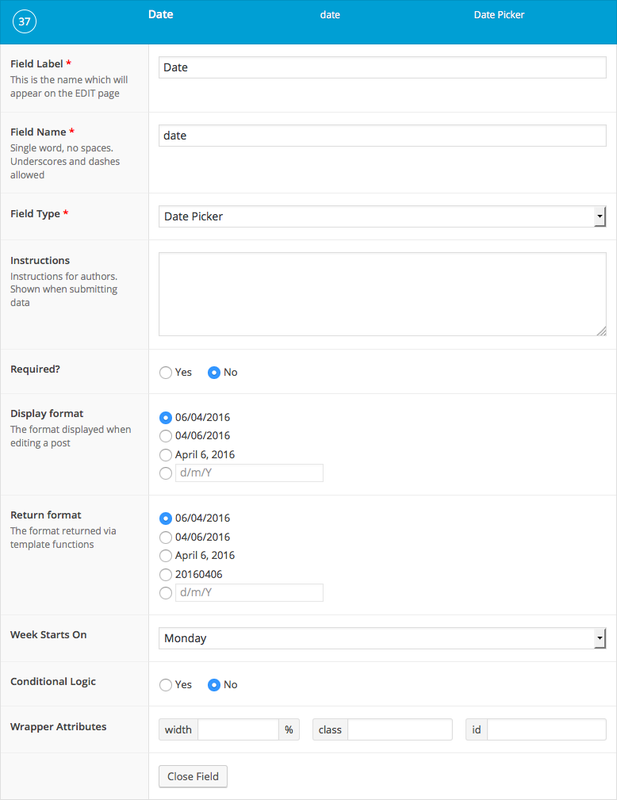 This example shows how you can sort and order a WP posts query by a custom field. This example shows how you can use the WP_Query object to find posts where a ‘start_date’ and ‘end_date’ indicate that the post is ‘active’ (today is between the start and end dates).